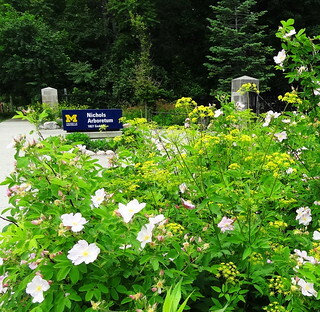 We’re in Ann Arbor today at Nichols Arboretum to see the largest collection of heirloom herbaceous peonies in North America. 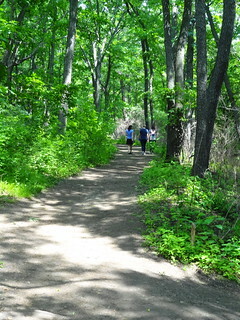 Operated by U of M, the 123- acre “arb” is located near the eastern edge of Central Campus. 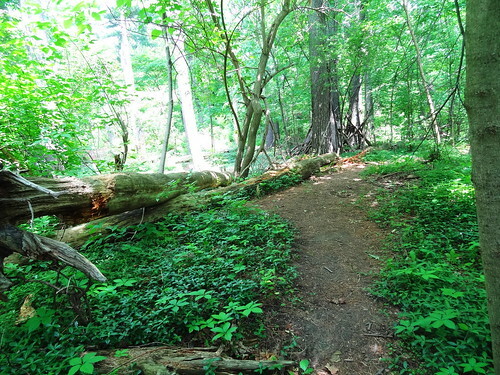 The naturalistic landscape was begun by O. C. Simonds back in 1907; home to natural areas, trails, pathways, specialty gardens, broad valleys and thematic areas, it provides an easy escape from the hustle and bustle of city life. We park in a neighborhood off Geddes Ave and make our way to the entrance; we are greeted by a floral display, a newer iron gate closes the gap between two very old stone posts. 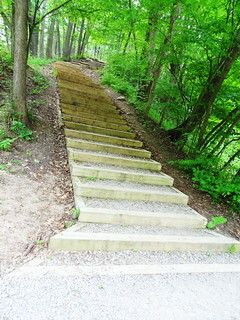 Walking straight out we reach the highest point in the arb, they say the escarpment and slopes were created by glaciers, here we have a panoramic view for miles. 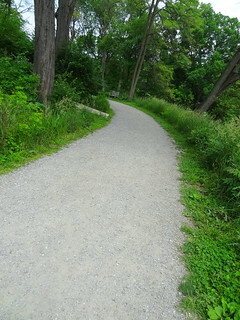 We begin our walk through the main valley following a wide gravel path north and west toward the Peony Garden. 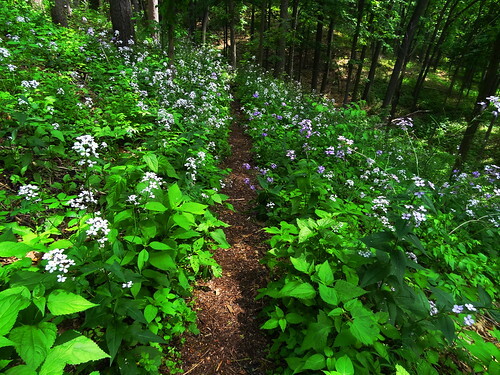 The path winds through shaded woodlands, giving us respite from the afternoon sun, wildflowers bloom in purple and white against a lush green background. 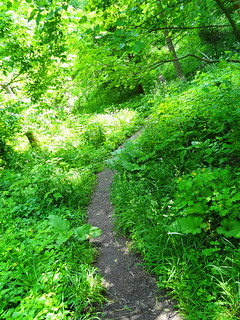 Leaving the main path, we follow a narrow dirt trail deeper into the woods, a deer nibbles leaves a few feet away. 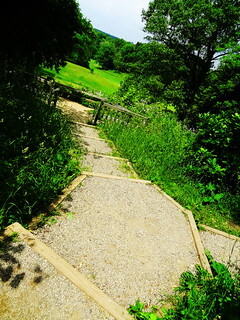 As we ascend the hill we eventually emerge from the woods, the peony garden is below us in the distance, a large grassy area surrounds it. 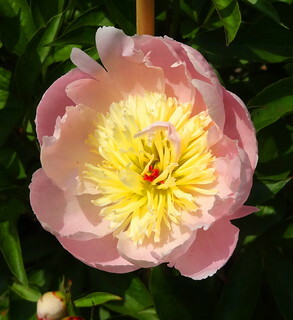 In 1922 Dr. W. E. Upjohn, founder of Upjohn Pharmaceutical Company in Kalamazoo and passionate collector of peonies, offered to donate peonies to the arb, regents accepted his offer, appropriated $2,000 to establish a peony garden, which then opened to the public in 1927. 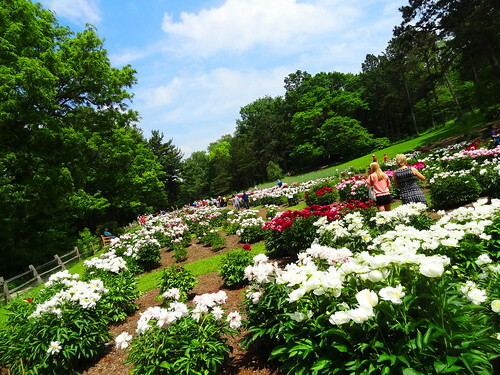 Today each of the 27 beds contains 30 peonies, the garden holds nearly 800 peonies and up to 10,000 flowers at peak bloom. 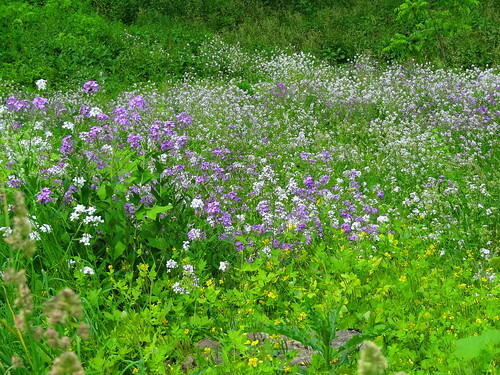 Our timing is perfect, beds are bursting with blooms in white, every shade of pink, deep red and burgundy, it’s fantastic! 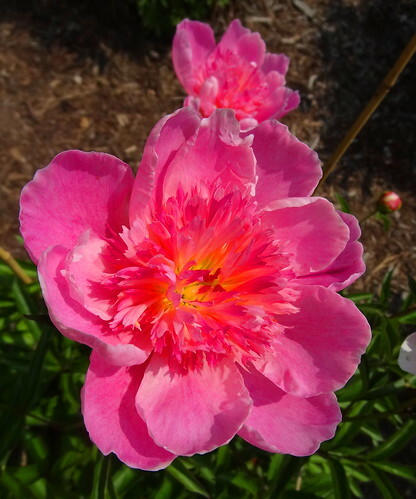 I wander from plant to plant in awe of their beauty, a closer look reveals the difference in varieties; some are shaped like goblets, others are flat and cupped, there are inner petals, outer petals, pistols and stamens, crowns and collars. Placards give detailed information, I love the names: Fortune Teller, Lady Emily, Do Tell, Loveliness, Madame Jules Dessert and Nanette. 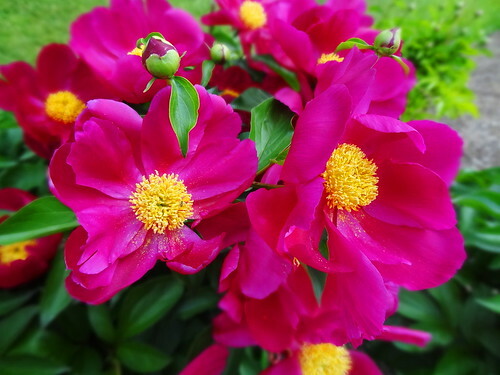 Some are quite fragrant, I bend at every one hoping to be rewarded with sweet fragrance. 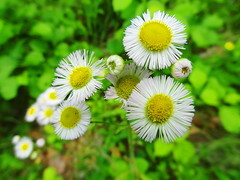 Kris joins dozens of others taking photos of these delicate beauties. Up close the colors are stunning, one is all white with flecks of red near the center, multicolored blossoms fade from bright rose to pale pink to white, centers are yellow or gold, petals are ruffled or smooth, wide or narrow. It is an amazing thing to see! 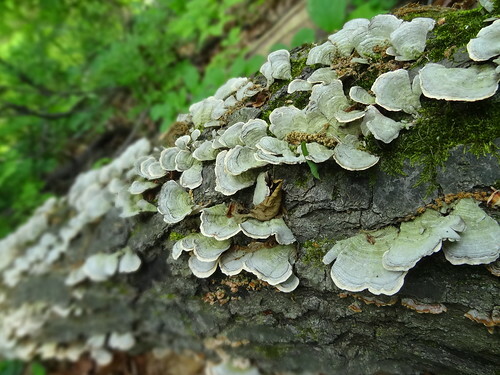 We choose a wide path that takes us through the woods, mushrooms cover a fallen tree, in the distance yellow flowers top reed-like stems, we come upon a stairway terraced into the hill, it leads us to the bank of the Huron River. 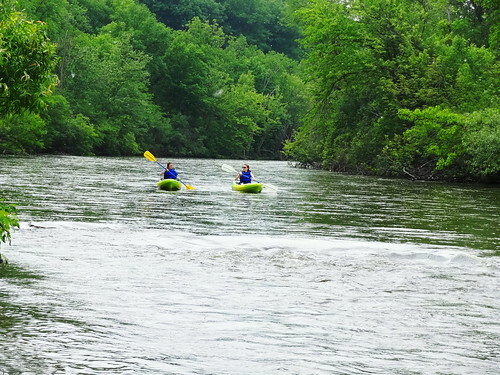 We stand in an open area, the sun blazes overhead, two women in kayaks drift by us carried by the current. Buildings on the opposite side of the river remind us we are actually in a city. 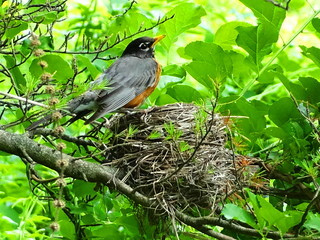 We duck back into nature, taking a more secluded trail this time, a Robin sitting on the edge of her nest watches us closely as we pass. 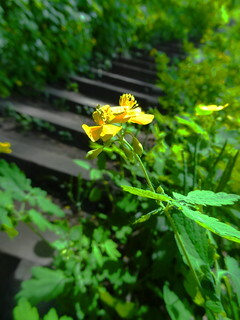 Mature trees and more wildflowers surround us as we make our way back, another set of stairs leads us gently up a hill, at the top we take in the vista that surrounds us, and then we are back to where we started. By now we are famished, Angelo’s On The Side is a short drive away, I hope we make it before they close. We’re in luck, there’s a space in the back lot and they’re open. The original Angelo’s opened in 1956, serving breakfast and lunch, it is still owned and operated by the same family. 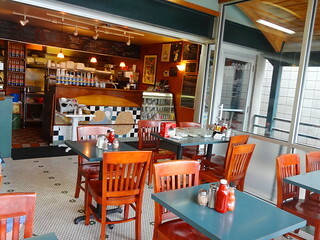 This side is a coffee-house and carry-out counter with limited seating for dining in. Chalkboard menus surround the counter, we quickly agree on what to order and take a seat overlooking the street. 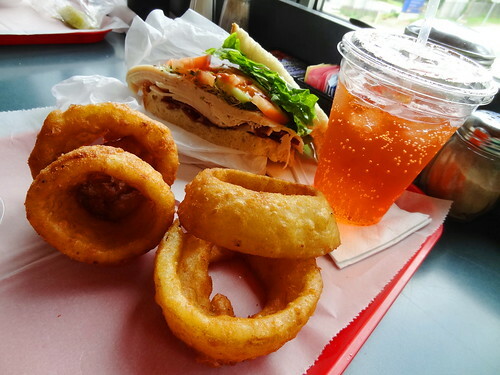 A wax paper lined tray arrives, upon it sits giant battered onion rings and a mouth-watering California Club Sandwich. A stack of turkey breast, bacon, lettuce, tomato, guacamole and cucumber are piled between two slices of exceptional homemade white bread Thick slices of onion are nestled in crispy batter; we exchange few words, the food is too good to be interrupted with talk. 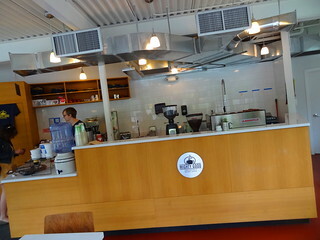 A couple of blocks away on S University we stop in at Mighty Good Coffee Roasting Co. before hitting the road. 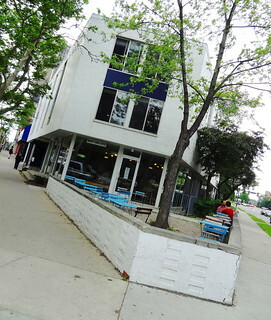 The coffee shop is located on the ground floor of a mid-century style building, three walls are glass and there’s also a patio. Kris and I drink cold-brew coffee regularly, every shop uses its own method and choice of bean; this is the first time we have encountered Nitro-infused cold brew. This method uses a stronger mix of cold brew concentrate with cold filtered water, they put it in a keg, add pressure and serve it up on a nitro tap. What you get is a creamy, slightly bubbly coffee that’s higher in caffeine. It’s usually served in a pint glass without ice, cream or milk, just looking at it you’d swear it was Guinness Stout. Kris orders one on ice, I stick with traditional cold brew. We relax on the patio drinking our coffee and sharing a chocolate chip cookie; the nitro is outstanding as is the regular cold brew. What a great way to end the day.